Who Are the Glow Kids? 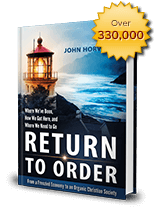 - Return to Order. Who Are the Glow Kids? - Return to Order. A bemused reader might scan the title of this book review and frown, “what in the world is a glow kid? !” But do not worry, the author of this review asked the same question when the book was recommended by a colleague. After reading the first few pages, however, confused readers will realize that the term “glow kid” is ingenious yet disturbing. 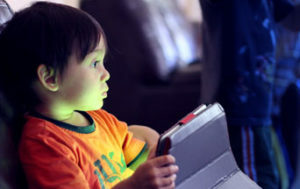 Dr. Nicholas Kardaras coined the term “glow kid” to refer to the ubiquitous scene: mesmerized children aglow by blue-hued screens. Their tiny fingers clutch glowing devices that demand their full attention. What’s the problem? Dr. Kardaras addresses the core of the tech problem with personal examples encountered during his career as an addiction expert. In one case, he counseled a young man who thought he was truly living in a video game. The boy was so addicted that he lost sleep for long periods of time and fell into a state of tech psychosis, which shocked Dr. Kardaras. This case was one of the catalysts that convinced Dr. Kardaras that the new yet often unaddressed problem of glow kids had to be tackled. Beyond problem diagnosis, the book offers solutions to overcome digital addiction and treatment options. From tech “fasting” to age appropriate tech exposure, Dr. Kardaras uses common sense and balanced logic to prevent or stop the glow kid problem. His methods are proven: in fact, he works with scores of people at an addiction recovery center in New York, treating screen addiction with many of the same methods used to treat drug addiction. Most importantly, his solutions are serious and effective. 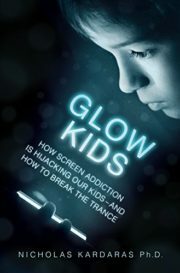 Any reader concerned with today’s growing screen addiction problem should read Glow Kids. It will open your eyes. Moreover, for parents, teachers and those who deal with children, Glow Kids is a must-read in order to learn the dangers of screens, and how (and when) to properly use technology in the home, school and elsewhere. This entry was posted in Featured and tagged book review, false happiness, frenetic intemperance, Glow Kids, Nickolas Kardaras, technology, Technology Addiction by James Donlon. Bookmark the permalink.